Our Computer Fundamentals Tests allow you to experience an online examination in the real-time environment. In every online test on Computer Fundamentals, you will be presented with Multiple Choice Questions (MCQs) which will test your skills in Computer Fundamentals Concepts in a detailed and comprehensive manner. In the test, each question will have 4 options to choose from. You should select only 1 correct option as an answer and then move on to the next question. Once you submit answers to all the questions, you will be given your final test score. In the Online Computer Fundamentals Test, for every correct answer, you will be given 2 points. There will also be negative marking of -1 for every wrong answer. So, you will have to be more careful in choosing the answers to the question in your online examination. If needed, you should skip to the next question and come back to the previous question later so that you can do proper time management for the online mock tests. 1. "Computer Fundamentals Practice Tests" - In Computer Fundamentals practice tests, there will be a series of practice tests wherein you can test your Computer Fundamentals concepts on every chapter separately. There will not be any time limit on these tests. So, Computer Fundamentals Practice Tests should be the first set of tests which you should attempt. Goto these practice tests here. 2. "Computer Fundamentals Mock Tests" - In Computer Fundamentals mock tests, there will be a series of mock tests wherein you can test your Computer Fundamentals concepts on every chapter separately, but there will be a fixed time limit per test. So, it is similar to Computer Fundamentals Practice Tests, but with an added constraint of time limits. 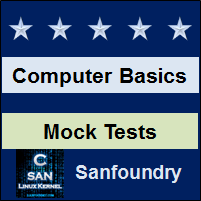 You should try Computer Fundamentals Mock Tests if you are appearing for any online examination soon. Goto these mock tests here. 3. "Computer Fundamentals Certification Test" - Once you are through with your Computer Fundamentals concepts, then you should try our Computer Fundamentals Certification Test wherein Sanfoundry will issue a free Certificate to you if you scored either Grade A* or Grade A in Computer Fundamentals Certification Test. Goto Computer Fundamentals Certification test here. 4. 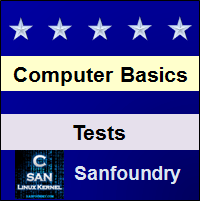 "Computer Fundamentals Internship Test" - If you are interested to do Internships in Computer Fundamentals at Sanfoundry, then you must take our Computer Fundamentals Internship Test. 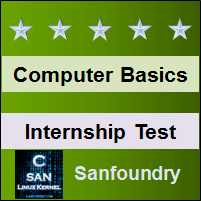 If you scored either Grade A* or Grade A in Computer Fundamentals Internship Test, then you are eligible for Internship at Sanfoundry in Computer Fundamentals. Goto Computer Fundamentals Internship test here. 5. "Computer Fundamentals Job Test" - If you are a fresher, a dropout, an experienced person and if you know Computer Fundamentals well and looking out for jobs in Computer Fundamentals domain at Sanfoundry (or our Network of Companies), then you should try and qualify our "Computer Fundamentals Job Test". 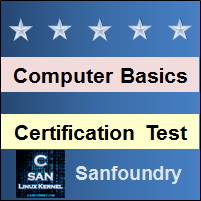 If you scored either Grade A* or Grade A in Computer Fundamentals Job Test, then you are eligible for a Job at Sanfoundry (or our Network) in Computer Fundamentals domain. Goto Computer Fundamentals Job test here. For every "Computer Fundamentals Practice Test", Total Questions: 20, Total Time: Unlimited. For every "Computer Fundamentals Mock Test", Total Questions: 20, Total Time: 20 Minutes. For "Computer Fundamentals Certification Test", Total Questions: 50, Total Time: 1 hour. For "Computer Fundamentals Internship Test", Total Questions: 50, Total Time: 1 hour. For "Computer Fundamentals Job Test", Total Questions: 50, Total Time: 1 hour. Before you get started on these series of online tests on Computer Fundamentals, you should learn, study and practice our collection of 1000 MCQs (Multiple Choice Questions and Answers) on Computer Fundamentals here. We also prefer that you should practice Computer Fundamentals practice tests and mock tests completely before attempting the certification test. Here is the list of online practice tests and mock tests on Computer Fundamentals. Each online test focuses on a "Specific chapter of Computer Fundamentals". So, you should try both practice test and mock test on every chapter to do a self-assessment of your knowledge (along with time-limit constraints) in every area or sub-topic of Computer Fundamentals. Computer Fundamentals Certification test, Internship test, and Job Test are mentioned at the end of this list. 1. Computer Fundamentals Test 1 – This set of online test on “Computer Fundamentals” tests your skills on The Input Unit, The Output Unit, The Storage Unit, The Arithmetic & Logic Unit, The Control Unit, Positional & Non-Positional Number System, The Decimal Number System, The Binary Number System, The Octal Number System, The Hexadecimal Number System. 2. Computer Fundamentals Test 2 – This set of online test on “Computer Fundamentals” tests your skills on Data Types, BCD, EBCDIC, ASCII, Unicode, Sign Magnitude, Booth's Algorithm, Complements, IEEE 32 and 64 bit, Binary Multiplication & Division. 3. Computer Fundamentals Test 3 – This set of online test on “Computer Fundamentals” tests your skills on Fundamental Concepts & Postulates, Boolean Functions, SOP & POS, Logic Gates, Universal Gates, CPU & Control Unit, Registers, Cache Memory, Processor & Its Types, Main Memory Organisation. 4. Computer Fundamentals Test 4 – This set of online test on “Computer Fundamentals” tests your skills on Sequential & Direct Access, Magnetic Tapes, Magnetic Disks, Optical Disks, Memory Storage Devices, Input Devices, Output Devices, Digitizers, Speech Synthesizers, System Softwares. 5. Computer Fundamentals Test 5 – This set of online test on “Computer Fundamentals” tests your skills on Application Softwares, Firmware & MiddleWare, Open Source Software, Open Source Initiative, Algorithms, Flowcharts, Flowcharting Rules, Pseudo Code, Structural Programming, Machine Languages. 6. Computer Fundamentals Test 6 – This set of online test on “Computer Fundamentals” tests your skills on Assembly Languages, High Level Languages, FORTRAN Basics, COBOL Basics, Testing, Debugging, Documentation, System Evaluation & Maintenance, Program Errors, Multiprogramming. 7. Computer Fundamentals Test 7 – This set of online test on “Computer Fundamentals” tests your skills on Multithreading, Memory Management, Virtual Memory, File Management, Word Processing Package, Spreadsheet Package, Graphics Package, Personal Assistance Package, File Management Systems, DBMS. 8. Computer Fundamentals Test 8 – This set of online test on “Computer Fundamentals” tests your skills on Components of DBMS, Transmission Modes, Modulation Techniques, Multiplexing, Network Topologies, Internetworking, The History of Internet, The Internet and its Services, WWW, FTP & HTTP. 9. Computer Fundamentals Test 9 – This set of online test on “Computer Fundamentals” tests your skills on Abbreviations Related to Internet, Text Media, Graphics Media, Virtual Reality, Animations, Generations of Computers, Parallel Processing Systems, Client-Server Computing, Cloud Computing, Types of Computers. 10. Computer Fundamentals Test 10 – This set of online test on “Computer Fundamentals” tests your skills on Internet of Things, Artificial Intelligence, Network Security, Network Security and Encryption, Encryption and Viruses, Cryptography, Augmented Reality, Waterfall Model, Software Testing, Concepts of OOP. 11. Computer Fundamentals Certification Test - This set of online free certification test on "Computer Fundamentals" tests your skills on all areas (all chapters, topics and subtopics) of Computer Fundamentals. 12. 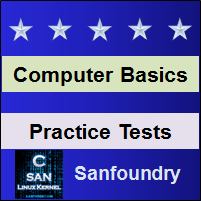 Computer Fundamentals Internship Test - If you scored either Grade A* or Grade A in our Computer Fundamentals Internship Test, then you can apply for Internship at Sanfoundry in Computer Fundamentals. 13. 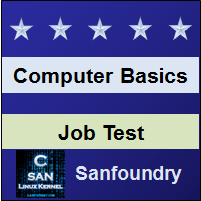 Computer Fundamentals Job Test - If you scored either Grade A* or Grade A in our Computer Fundamentals Job Test, then you can apply for Jobs at Sanfoundry in Computer Fundamentals domain. Best Wishes for your Computer Fundamentals Tests!